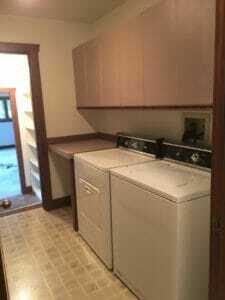 When we bought our house, the laundry room was overall the least attractive space in it. Mauve Formica laminate cabinets and counters, stained plastic wash sink, super old free standing fridge and freezer units (without any in the kitchen) and beige vinyl flooring. Dingy, outdated and generally yucky to say the least! Step 1: Completely gut the room! We removed the flooring, 4 old appliances (washer, dryer, refrigerator, and freezer), laminate cabinets and Formica counters and plastic sink. The only original thing still in the room is the light fixture and this is only because I was able to change the globe out to a tolerable clear one and use a properly toned, extra bright LED bulb. I’ve got a new light fixture on my to-find list but it’s proven challenging because of the limited drop space. Step 2: Reconfigure the space. To accommodate a much needed closet in the room opposite the back side of the old washer and dryer, we went down to the studs, built a wall, and moved the hook ups for the washer and dryer to create an alcove that now houses the new stacking washer and dryer plus an upper storage shelf for rarely used guest linens. The wall (where the washer and dryer used to be) now hosts a gallery of family black and white photos. 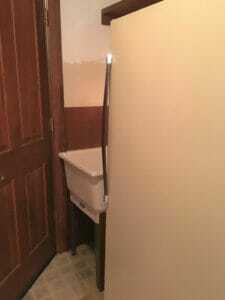 Step 3: Add cabinets with granite counters, a small book shelf nook, and an attractive utility sink. We re-purposed white cabinets (from the remodeled kitchen) and based the layout off them. We also re-purposed the kitchen’s black granite counter tops and cut them to fit the new cabinet configuration. I’m normally not very fond of black granite counters but in this vintage farmhouse feeling space, I like them. Step 4: Replace the vinyl flooring with hexagonal tile and paint. Step 5: Add accessories and vintage touches. I’ve collected French enamel signs for many years, as well as black and white stoneware (also called transferware), so I was so happy to be able to display a few signs here as well as hide clothes pins, small scissors and safety pins in a Victorian era lidded soap dish. 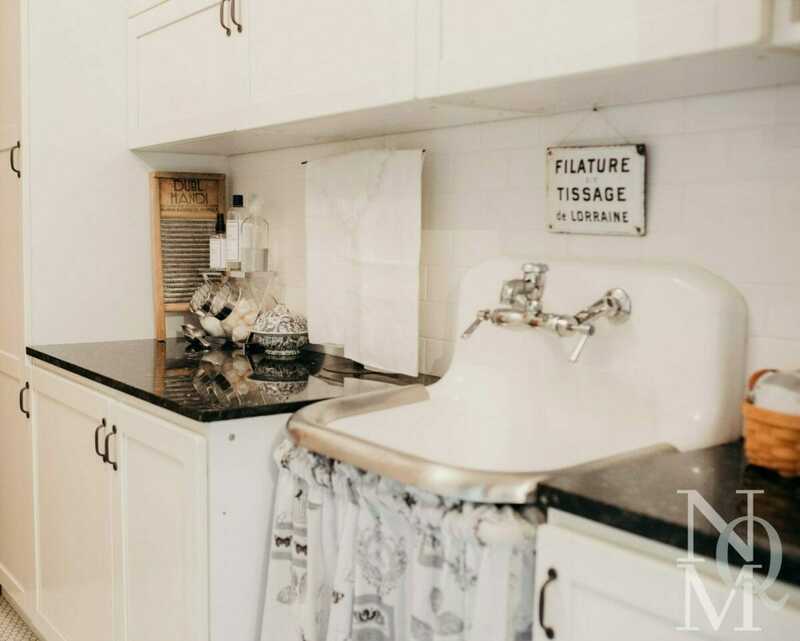 Other touches include a vintage T-style towel rack with a trio of antique hand towels, a small vintage wash board and a stainless rack with glass storage jars for detergents. Although not shown in any of these photos, I added a chrome, vintage look drying line that is retractable and super useful. My mom found a pair of reproduction french advertising hooks years ago that are perfect for wash rags and the little basket below holds my lingerie bags. Step 6: Add storage baskets. I used the tops of the upper cabinets to store rarely used items and also display baskets I only use for parties. When I lived in Germany before my 16-year-old was born, I became friendly with a woman that sold Longaberger baskets and over time I ended up with quite a big collection of them. Because I lean more towards a European country look, they’re not totally my style but I appreciate that they’re handmade in the U.S. and I like that they have liners and lids for most styles so they’re great for storing things in. And they obviously hold up well given that they’re around 17 years old! And finally, the door mounted laundry basket (below) is for stashing specialty items and my husbands shirts that go to the dry cleaners. So there you have it! I finally have an attractive yet high functioning laundry room! Comment and let me know what you think either here or on Instagram. We’re about to paint the wood trim in most of the house so once it’s done I’ll post an updated look at the room. Thanks for reading!